It must have been via The CoolHunter. Regardless, in whatever way we stumbled on CJ Hendry we’re glad. Her art work is out of this world, bordering on photo/hyperrealism save for being solely drawn in pen and ink. Subject matter varies from vertebrae to Vuitton and everything in between. Immediately falling head over heels in love with these meticulous drawings, Boboli owner Margie Murphy decided the perfect place for a CJ Hendry original was in the store. 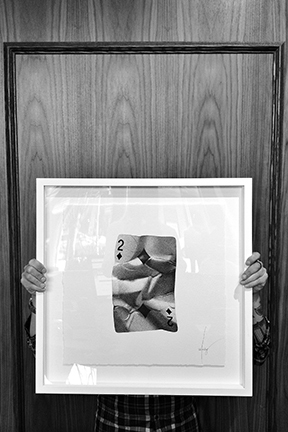 Within weeks we were the proud recipient of The Two of Diamonds from her 54 illustration playing card series.